The Colorado Photographic Arts Center presents Vestiges, a solo exhibition featuring photographs by Colorado-based artist Angela Faris Belt. Vestiges is a visual meditation on humankind’s influence on nature, created over several visits to a unique grove of Bristlecone Pine trees near Belt’s home in the Colorado mountains. Belt photographed this series over two years (2015-2017) using Polaroid Type 665 positive-negative film that expired in 1986. This special off-site exhibit is presented in conjunction with Month of Photography (MoP), a biennial celebration of fine art photography with hundreds of events throughout the Denver Metro region in March and April 2019. For a complete list of exhibitions and events, visit mopdenver.com. Pictured above: Vestiges #47, detail, by Angela Faris Belt. I have held a lifelong interest in the intersection between humankind and the more-than-human world we inhabit. As an artist, my work centers on this intersection, fusing with it the language of photographic media through which I study and represent it. Vestiges is a visual meditation on humankind’s influence on nature, created over several visits to a unique grove of Bristlecone Pine trees near my home in the Colorado mountains. These pines, many well over 1,000 years old, have prospered in some of this planet’s harshest environments. Rising from thin, arid soil along the 11,200-foot tree line, they can endure fierce perpetual winds, long periods of drought, and year-round temperatures hovering near to well-below freezing. I am awed by their formal beauty, carved from the austerity of the remote environment they call home. I am moved by their strength and resilience against time, wind, altitude…everything but us. These ancient trees, some alive since the Roman Empire, are, at last, dying. Their slow demise is due to human introduction of blister rust fungus. The trees have no defense against this invasive lethal fungus, which also acts to weaken their defenses against destructive native insects. Formerly benign to bristlecone pines, pine bark beetles have begun infesting the trees aided by our warming climate’s longer summers. Witnessing these trees now, it’s hard to imagine that the combined forces humans have brought to bear—invasive species and climate change—are killing this ancient species that is not only significant in its own right, but has proven to be beneficial for watershed protection and wildlife habitat. But beyond existential and ecological relevance, these trees have helped define our very notions of the American western landscape. I have visited this grove of trees throughout the 15 years I’ve lived in Colorado. I visit them as one would a temple or a sage, I and consider the myriad global changes through which they have stood. I photographed them throughout 2015-17 using Polaroid Type 665 positive-negative film that expired in 1986. 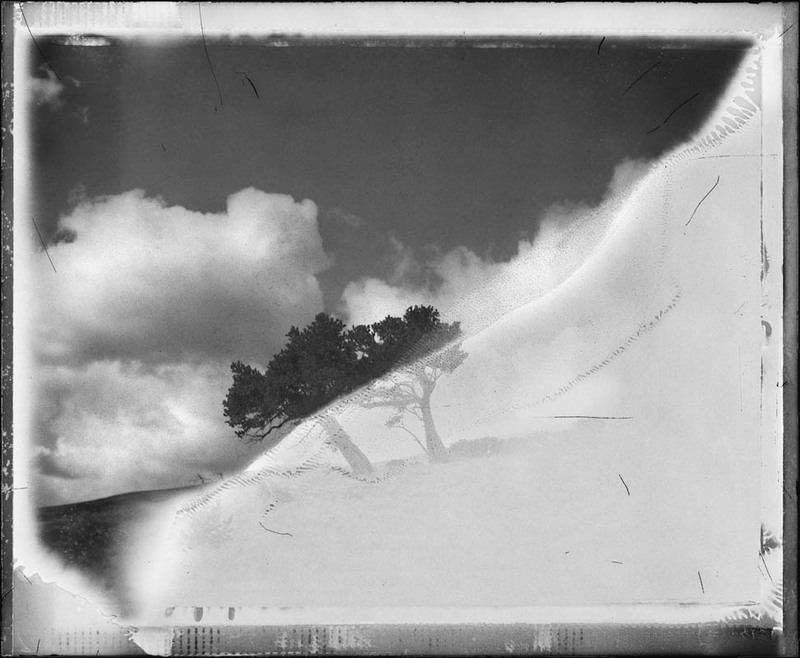 The visual implications of the expired film—its imperfections and truncated tonal range—juxtaposed with the unique Bristlecone Pine forms, underscores the steadfast value of the past, and a sense of unease as we move into a future where industry and technology supersede our adopting a balanced place in the natural world. Angela Faris Belt is a visual artist working in photographic media that ranges from historic to digital processes. Creating artwork that centers on humankind’s relationship with the natural world, she combines specific media to underscore the concepts behind each body of work. Angela’s work has been widely exhibited in prestigious juried and invitational exhibitions including Corden/Potts Gallery, San Francisco; BJ Spoke Gallery, NY; Arvada Center for the Arts, CO; The Dairy Center for the Arts, Boulder, CO; Foreman Gallery, NY; and University of Notre Dame’s Photography Gallery. Her work is held in collections including Kaiser Permanente, Reynolds & Reynolds, the Crowne Collection, Chicago; the Smithsonian Museum and the Archdiocese of Prague. Angela lives on a 9,500-foot mountainside surrounded by National Forest in Colorado’s Front Range, with her husband Dave, three household pets, and neighbors: elk, deer, fox, coyote, bear, and mountain lions. She is Program Chair of the Studio Art & Art History programs at Arapahoe Community College; in her off-time she builds stone walls and participates in bark-beetle mitigation efforts.